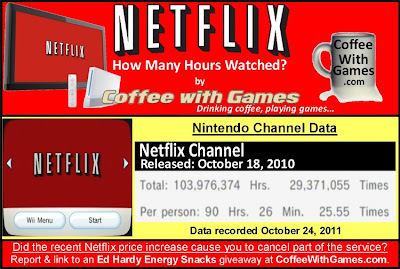 Coffee With Games: The Netflix Channel - How Many Hours Watched? If you want to enter the giveaway of Ed Hardy Energy Snacks, click HERE to do so. The Wii's Netflix Channel now has about 1,149,552 Wii owners that have reported hours of watching videos through the Nintendo Channel, with 371 days possibly reported. According to the reported data, Wii Netflix users are watching the Netflix Channel about 3 Hours 32 Minutes per day/session that is reported. Reggie Fils-Aime, Nintendo of America's President, said that more than 3 million Wii systems were using the Netflix service before the Netflix Channel was added last year. Based on Reggie's own numbers from last year, and the current number of Wii owners reporting Netflix Channel data; only about 30% of Netflix Wii users are using the Nintendo Channel to their hours, assuming all the original disc based Netflix users downloaded the Netflix Channel. As for the money side of things, if all Wii owners that have reported data are still active Netflix members, Netflix is making about $9,184,920 per month from Wii owners. The Wii's Netflix Channel in our house is used nearly daily by Mrs. Coffee. She uses is to watch cartoons with our oldest son, and she enjoys watching some television series for herself as well. I have written about how our son enjoys SpongeBob Squarepants occasionally and shows like Phineas and Ferb, but his all-time favorite as of right now are the Thomas the Train series available on Netflix. While we of course were not happy about the Netflix price plan increases, we have stuck with the service for now; though we are debating on canceling just the DVD portion of our service. I forgot to capture our reported Netflix Channel data, so I will do that in a bit and put the picture below. Don't be shocked when you see how much we have used it in the last year, as I don't even know, but I am very suspicious the number of hours reported above 500 "Total Hours". Are any of you still using the Wii's Netflix Channel regularly? Also, did the recent Netflix price plan increases and changes cause you to change/cancel part of the service? Also, are there any television series you would recommend to other Netflix owners that are available on the streaming service? I would probably recommend the Prison Break season, if you like a suspenseful and real-life setting, with some nice conspiracy elements thrown into the show. In Canada, I think Netflix became available only weeks before the channel came out. I remember getting my Wii Netflix disc in the mail after the channel was available, so that disc has never been used. Since Canada only got the streaming service, we weren't affected by the price change. At first I used to split my time between streaming on the computer and on Wii, but then my Wii became slow on downloads for some reason. I started streaming on my brother's PS3 for a while, but now that I have a new computer with a 24" screen, that's where I spend my time streaming. As for show recommendations, I've been watching Early Edition, which I would watch as much as I could back in the day on a canadian channel, but only ever saw a handful of episodes. For those who might not know the show, it's about a guy who receives tomorrow's newspaper today and spends his day going around town trying to prevent accidents and what not. It's a fun, lighthearted show anyone can enjoy. Ah Netflix, I think my 3 year old could run the company better. They offered the streaming at too sweet of a deal initially, then they couldn't handle the bandwidth from all of that HD content. Which brings me to my point. They should have separated the pricing structure by HD / SD not disk / streaming. I loved the service. For once an interface for my TV that was not just useful, but actually very intuitive and responsive. Blew away what both of the cable companies here have to offer. Shame there wasn't much to find. The image quality also was quite terrific. Like watching a DVD. Now its just not worth it to me given the new pricing. The HD content available to me from cable is to compelling to keep both around. The price hike didn't effect me, I'm only interested in streaming. A couple of shows that I have thoroughly enjoyed on the service are Deadliest Warriors and Monk. We use it regularly mostly like you said, for the kids. We had the 1 DVD out at a time plan as well as the streaming but dropped the physical DVD plan. We barely used it and most of the movies we wanted to see were in blu ray form at the library anyways. Some series I'd recommend if you're into comedy is Arrested Development. And if you're into sci-fi, the Terminator series: Sarah Conner Chronicles. Takes place after Terminator 2. Pretty good and fills in some gaps. @Coffee - What are your thoughts on the Netflix hoopla over the past couple of months? We get Netflix, just the streaming service - we were hardly using the discs anymore even when they changed service and upped price. It was a slight bummer - less value than we were getting before, but there's a lot of shows that all of us like and get to watch. My younger two have their shows, which they could probably catch on Cartoon Network, but my oldest really likes Anime and there's a pretty decent selection out there it seems. My wife watches it all the time, even just as background noise with television shows. I don't watch a lot of tv or movies, but I have enjoyed letting some shows like Stargate and Highlander run in the background when I'm playing games in my den. The Wii however, gets the least amount of love. Really, the 360 doesn't stream it much either because I'm the only one in the family with a gold account, so most of the Netflix streaming we do is via the PS3's or my wife's iPad. I'd agree with Charlie on Arrested Development. We have all the seasons on DVD and it's absolutely brilliant. That was it's downfall too. I really wish Nintendo had Canada's data reflected as the country as a whole, and not individual provinces/territories, as it would greatly help when looking at data for the area, as I have done with a few games in the past. Thanks for the recommendation on the show, I don't know if it's listed on our Netflix, due to the ratings differences, but I'll have to check to see if it is and report back! "Ah Netflix, I think my 3 year old could run the company better." As for, "Like watching a DVD." that doesn't bother us, as we only have SD TVs...so the "HD" stuff doesn't really matter to us right now. Thanks for the show recommendations, I'll check out their descriptions and see if we might be interested in them! As for the Netflix hoopla, we of course didn't like the price increases, especially with the news of Netflix losing the Starz videos next year, as that seems to be a good bit of the streaming stuff...we are weighing our options, which Netflix still seems to be the cheapest route right now. You know, we have flip-flopped with the consoles we have used for the Netflix service. While Mrs. Coffee was home with the new Little Bean, the PS3 was used some...but now it's pretty much just the Wii, and it's used daily as our reported hours probably show, :). Kind of interesting you mentioned your wife's iPad, as I installed the Netflix app on my iPod Touch, but have only used it maybe two or three times. Night owl commenter I see...welcome to the club! As for you never using Netflix, do you have a regular cable/satellite service you use? Thank you all for the comments/feedback. I greatly appreciate it! @Coffee: LOL, yeah it's late, but I now have an hour on you so it's not that bad. We would rent streaming movies from our cable company, but never did it consistently enough where Netflix was the better buy. Typical movies were $3.99 or $4.99/ea so netflix was the better buy if we got at least 2 per month; though there were many months where we rented nothing. @coffee - yeah, I've never really been a fan of the smallish screen of iphones and ipods - but the ipad's actually works pretty well for things like when we're off visiting family overnight or something and want to watch something quiet in the guest room. She also uses it when I'm tying up the ps3 or even if she's taking a bath (she props it up on a stand and will watch a movie then).